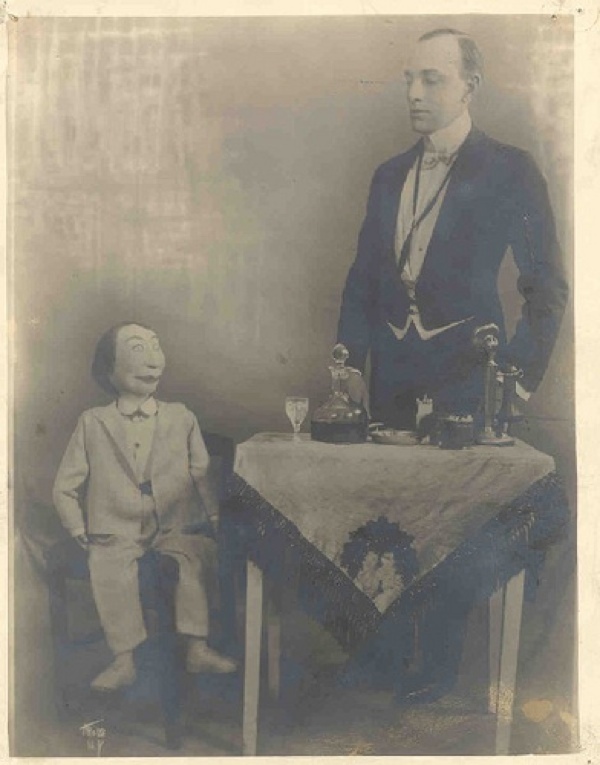 Ventriloquism is the art of projecting your voice so as to cause an inanimate object to appear to be alive. 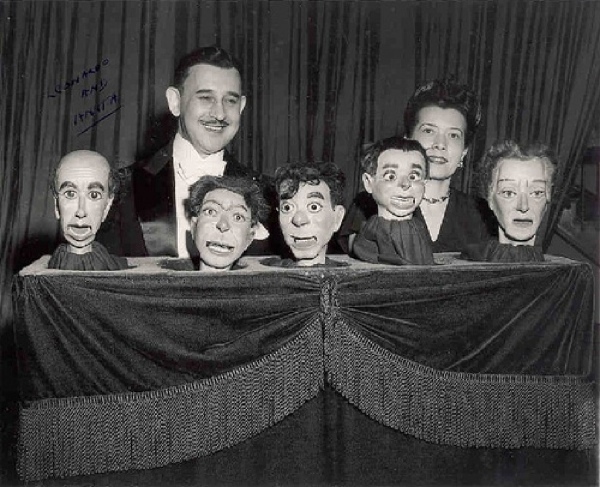 It is a rather creepy concept when you think about it but it is made even creepier by the fact that so many ventriloquism dummies are downright horrifying to look at. This is largely unintentional but it certainly does lend a bizarre aspect to this particular form of “entertainment”. 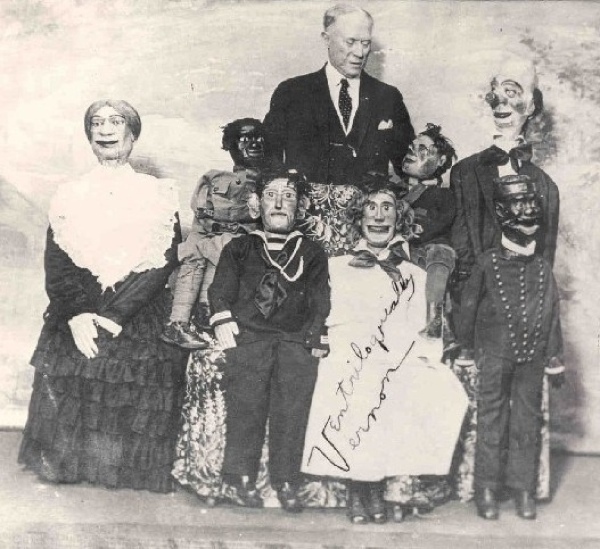 Here are fifteen rather hideous and frightening Ventriloquist Dummies. 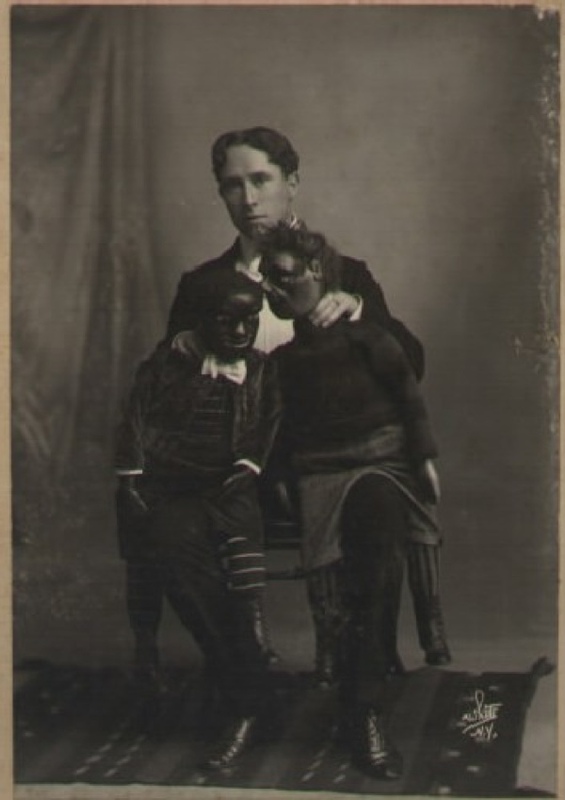 The ventriloquist in this picture is Jules Vernon. 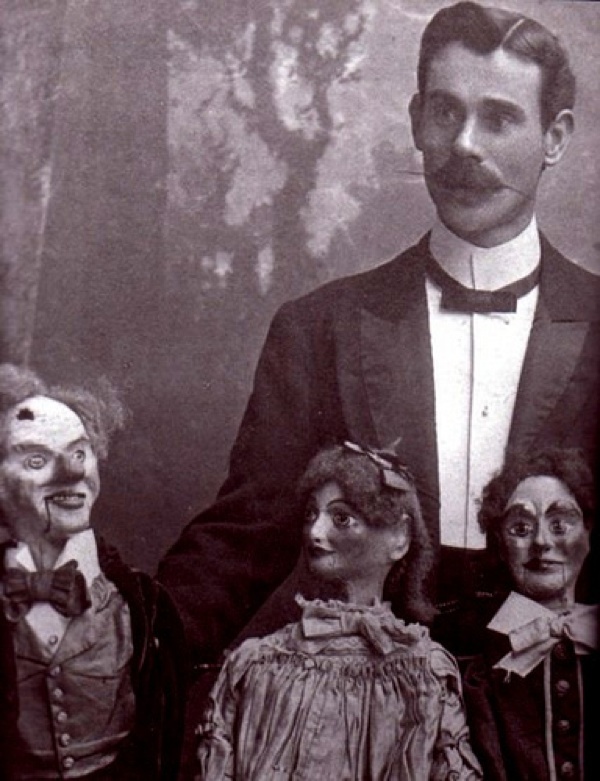 Here he is surrounded by a horrifying family of dummies. 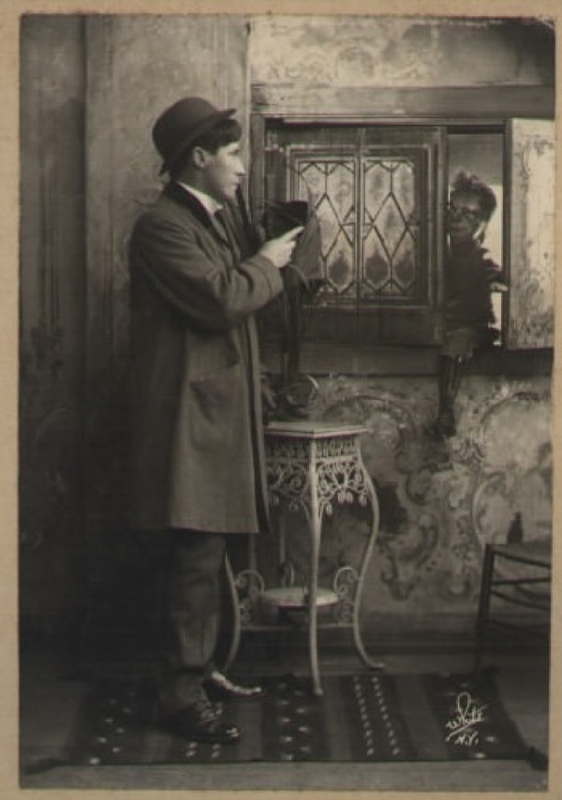 On Christmas day in 1920, Jules went completely blind in the middle of a show. But that didn’t stop him. But what did stop him was a speeding taxi that struck him down in 1937 killing him instantly at age 70. A number of the other photos here are also of Vernon. 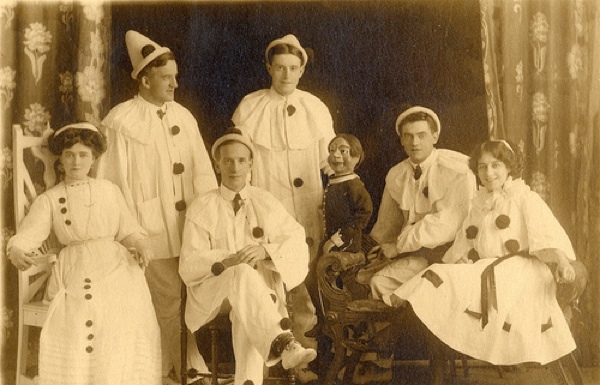 I am not sure what is scarier – the horrible dummy or the people in clown suits covered with polka dots and wearing KKK hats. Here we see a younger Jules Vernon with two dummies that appear to be conspiring against him. 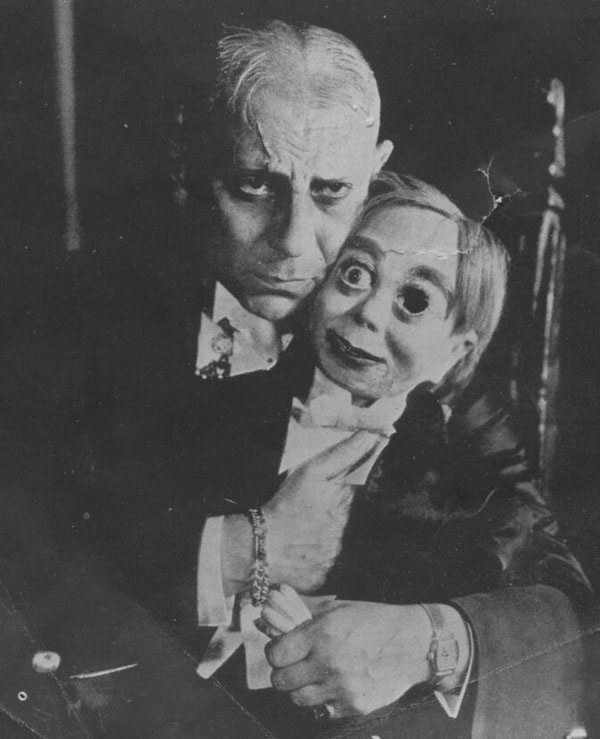 No list of vintage ventriloquist dummies would be complete without the one-eyed dummy. His owner doesn’t look particularly pleasant either. 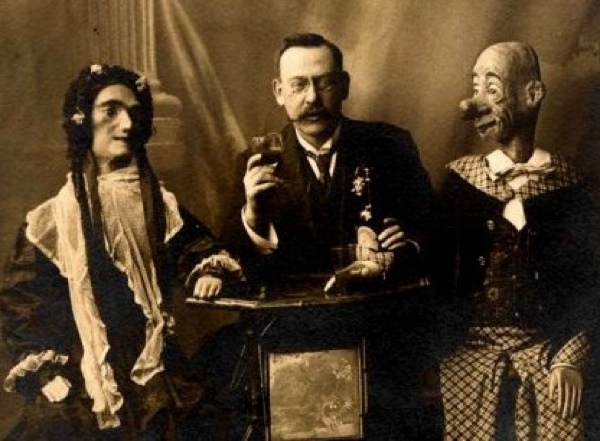 The dummy on the left seems to be the inspiration behind Father Jack from the comedy series Father Ted. It is a little hard to tell which are the dummies and not. 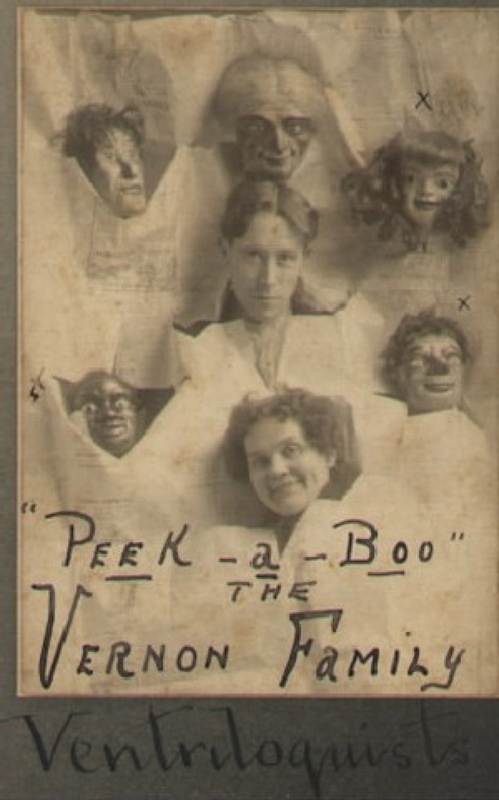 Again we have Vernon, his wife, and five creepy children made of wood. Clearly we have the inspiration for Leatherface from the Texas Chainsaw Massacre here – right down to the apron. It is striking how many of these dummies look so much like characters in modern pop culture. This one is reminiscent of Peewee Herman. Peewee was probably a little creepier though to be honest. 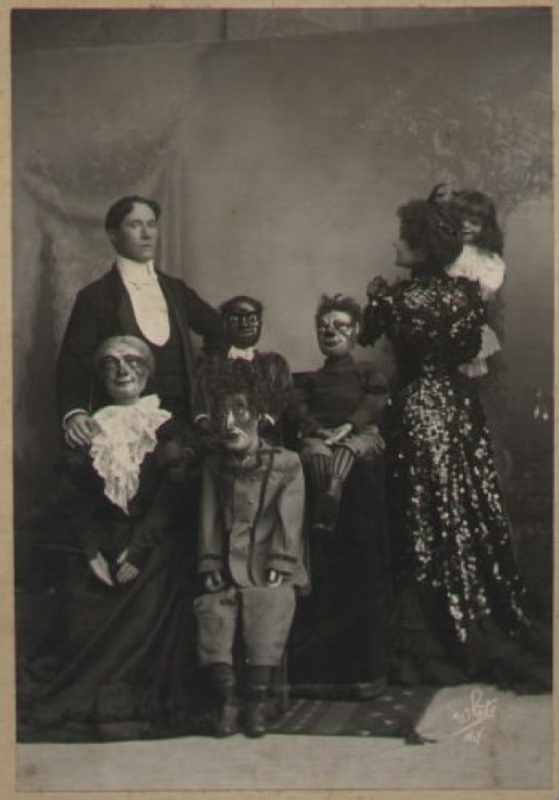 Here is the Vernon family again – and the kids seem to be growing up – into giant sized wooden demons. Particularly menacing are the two fellows in the back staring right at the camera. The dummy on the right is bad enough – but the one on the left looks like a cross between Elena de Hoyos and Norman Bates’ mother. 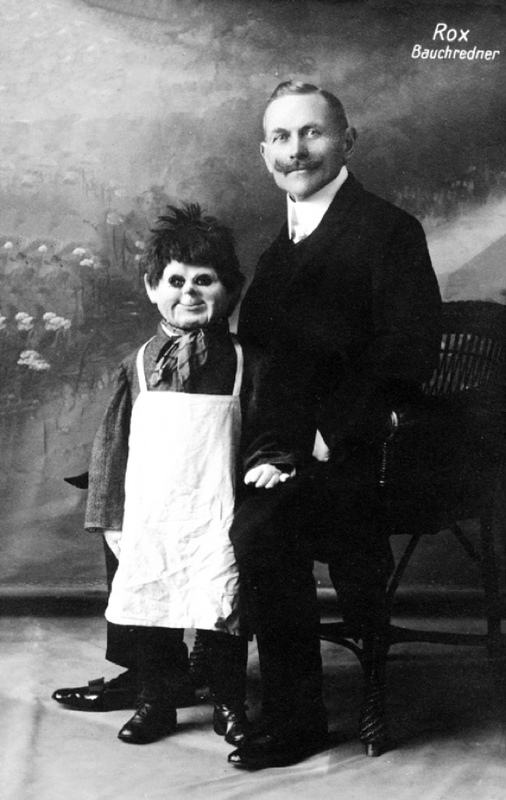 There is just no excuse for having a ventriloquist dummy as horrifying as this. What child would want to see that at his birthday party? 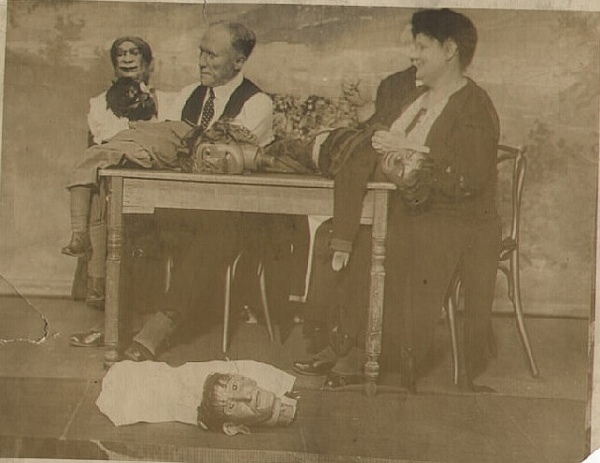 What do you do when your ventriloquism dummies try to kill you in the night? Chop off their heads of course. This is so horrible I am not even sure it is a real dummy and not something from a horror movie set. The cute bunnies behind them don’t help at all. 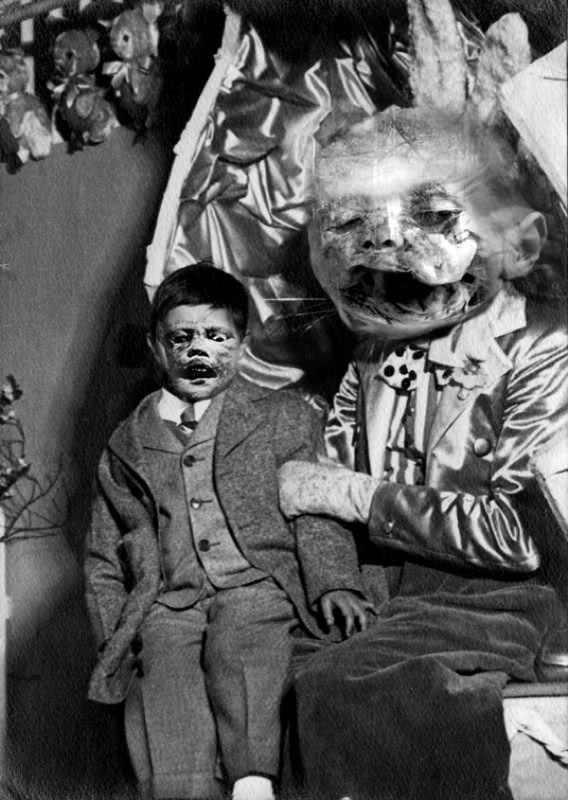 Now that Mr Vernon and his wife are sick of their kids, they have chopped them up and are preparing to eat them for dinner. If the previous dummies don’t give you nightmares this one should. 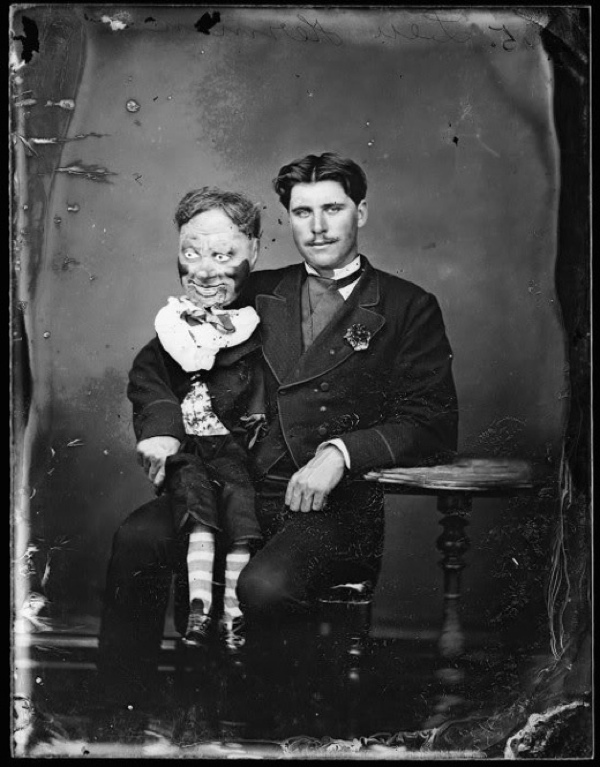 It isn’t just a horrifyingly ugly ventriloquism dummy – it is one that can move on its own and it’s climbing in the window to get you.